Informational currents are the nervous system of an organization. Information is no less important than tangible assets. The activities of any company depend on the speed, the quality and the expedience of information. The existence of an electronic system of document management is as necessary as the automation of tax or financial accounting. You can forward all the official correspondence to your contractors and correspondents electronically, signed with an Electronic Digital Signature, in “1C: Document management” through the External documentation Server, or send hard copies by post. For these aims you need to pack a hard copy into an envelope. But for the letter to reach the addressee the envelope has to include accurate and legible names and addresses of the addressee and the sender. To speed up the posting process there is a “Envelope printing” program. All you need to do is to put the document into the envelope and send it by mail. 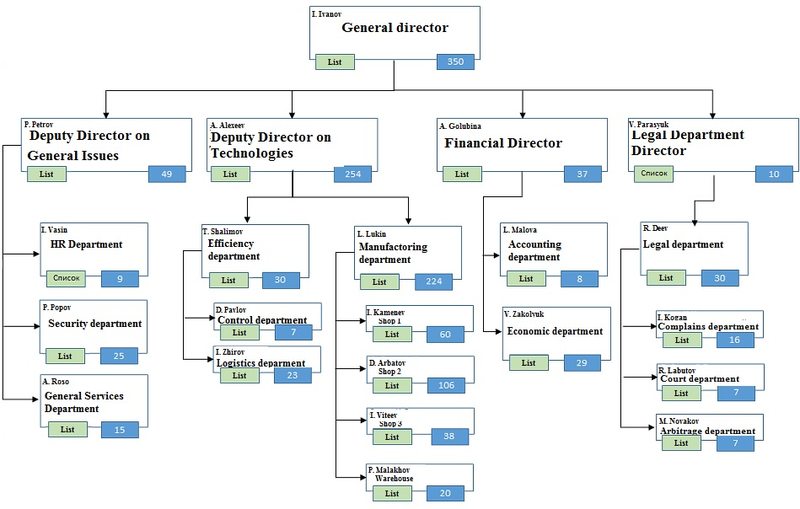 Automatic formation of the company’s organizational structure tree based on the “Company structure” directory. Using QR-code on the printed document forms allows to replace standard negotiation list and will be an indicator of the final version of the document. In case of electronic negotiation the negotiation list with all the versions of negotiation and the remarks are stored in electronic format in the document management system. You don’t have to print it, and you can just cipher the information contained into the negotiation list into a QR-code and print it on the second copy of the contract. By using a mobile device, the manager while signing the original hard version of the contract may find all the data from the negotiation list by using the QR-code (information on who and when negotiated the document and with which remarks). You will also have the QR-code as a symbol for the confirmation/signing of the original document by the manager into the card of this document into “1C: Document management”. Hard copies of primary accounting documents are signed by a “live” signature confirmed by a blue seal of the organization as on behalf of the Contractor and on behalf of the Client. Exercising control over the return, the storage of such documents and their quick search are relevant, especially while preparing for the tax inspections and arbitral courts. ensure quick access to the scans of the hard copies of the original documents straight from the accounting system. At the same time, the scan-copy will be stored into “1C: Document management” as is its self-consistent element, for example, being able to take part into the negotiation, confirmation, registration processes. Full-text search, control over the delivery of the original document, connection with the case nomenclature are available. There is organized a stream scanning with detection of return financial documents for the contracts: TORG-12, VAT invoices, Appendix №4, order and automatic addition of the scan-copies to the contract’s card. Stream scanning of the incoming financial documents from the contractors: TORG-12, VAT invoice from a contractor, automatic creation of a document’s card into the workflow with an attached scan-copy, forwarding the incoming financial documents to the accounting department for procession, using the exchange plans. 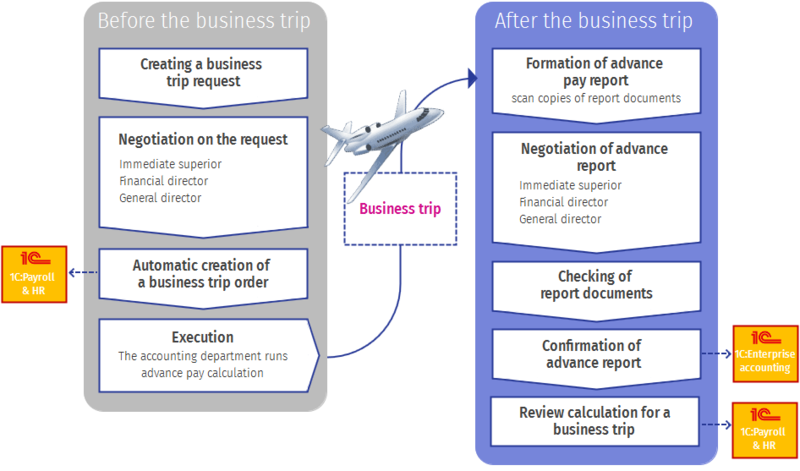 A “Goods and services realization” document is formed into “1C” system. The module automatically creates the respective document card into “1C: Document management”, filling in the correspondent’s information, the document type, the folder, the executor, the department, the number, date and the name of the document. The printed form of the “Goods and services realization” document is formed with a barcode. After the return of the signed originals of the primary financial documents from the contractors all of them are put on scanner and scanned with the help the stream scanning function into the respective folder. “1C: Document management” by a regulated task processes this folder and adds the scan-copies to the document card by its barcode. It is possible to enhance the functionality according to the individual requirements of the Client. The main task in working with “1C: Document management” is keeping a directory of the contractors, the relevance of their company information and also the information, which at the time of the conclusion of a contract serves as the basis of making conclusions about the contractor’s reliability, the scale and the financial indicators of his business. The majority of this information can be gathered in the program itself using the contractor’s folder function, included into “1C: Contactor” service. Al the information about the organization is gathered from the open sources and doesn’t infringe its rights. The note on the results of the check is left into the contractor’s folder. Control points may be used both with the project plan as a structural work decomposition as well as instead of it. Control points management is based onto the weekly evaluation of the possibility of the successful achievement of a certain control point within the planned time limit. The evaluation is performed by a person responsible for each control point.